Van Long is a land full of mysteries, is an ideal home for plants and aniamals. It is home to 457 species of higher plants, including eight species listed in Red Book of Viet Nam. It comprote 39 species of animals including 12 species are rare and precious as: primates, lorises, chamois, bears, etc., and especially the famous monkey pants leg. A poetic picture unfolds before your eyes: the mountains kiss the clouds, reflecting in the water surface forming a spectacle neither real nor imaginary. Purpose of the mountains Quan, Nghien, Trong interned with green trees whose leaves feed the monkeys in pants leg. Those animals that do vivrent in these mountainous areas and in the Cuc Phuong National Park. During the day, we can see down to eat or drink. The boat glides over the carpet of algae preserved. The Marble Mountains with their legends take visitors to a magical world. 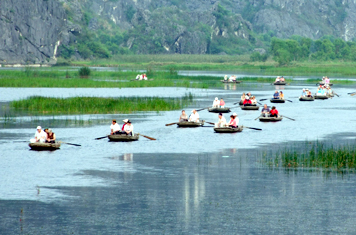 According to statistics from the Department of Culture, Sports and Tourism of Ninh Binh, Van Long together 32 beautiful caves such as Ca, Bong, Rua, Chanh, Each cave has its original beauty. Van Long is not only a nature reserve submerged but also a site of historical heritage. It is a mecca for eco-tourism but also a place to study ideal for researchers, students and Vietnamese and foreign students.